When it comes to trailered boats nine out of ten trailering malfunctions and accidents can be directly traced back to a failure to dedicate some time to the most basic preventative maintenance. Wheel bearings, suspension parts, lights, and a host of other components require constant attention to help insure any trailering trip smooth and hassle free. Special attention to the tow vehicle's hitch is a good idea, as that is the only link between the tow vehicle and trailer. Also consider the fact that one needs a special license and classification to drive things like motorcycles, school busses and vehicles with air brakes like semi-trailer trucks, gravel trucks, etc. 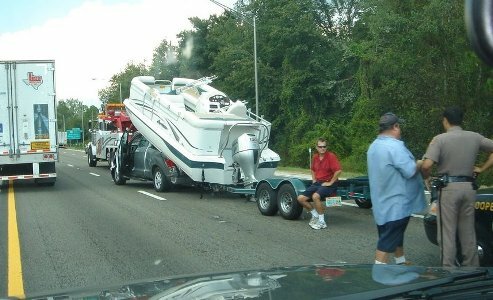 But just about anyone can go out and buy a $30,000 boat and trailer, attach it to his/her car and simply drive away. No special training is required beforehand and no special license classification is needed. Anyone who has ever hauled a boat around for a number of years knows that it may not be too difficult to drive in a straight line at low speeds. But when it comes to things like driving at highway speeds, passing other vehicles, high winds, backing up, etc... the task becomes much more difficult than one might think.